The other day I had one of those lovely little videos pop up on Facebook, the ones where they put together a selection of your best moments from the previous year and it reminded me to put this post together. 2017 has been a fairly eventful year for our little family. I gained a niece and a nephew early on in the year, had a couple of lovely holidays, and of course got married! The year seems to have gone by much faster than usual, perhaps because I was wishing the time away until our wedding in September, perhaps because I was on maternity leave with Benjamin. Over the summer I made the tough decision not to go back to work, and I handed in my notice. Although hard, this has allowed me to focus more on my blog, and last month I managed to finally go self hosted, something I had been meaning to for awhile. 2018 started off to a brilliant start, with babies being born in both Ed and my families. My brother and his wife welcomed their first baby girl in February, but just before then we made the long trip up north to visit them in County Durham to celebrate the impending arrival for Becky’s baby shower. Whilst we were there we fit in a meal at our favourite restaurant up there, The Church Mouse, and I got to have the delicious Hunters Chicken. Every year since we met, Ed has been surprising me on Valentine’s Day with an activity he has planned. The first year it was horse riding, which was incredible, and something I hadn’t done before. This year it was something a little further outside my comfort zone. Ed had booked for us both to go indoor skydiving, which terrified me, but I decided I had to give it a go. Unfortunately this resulted in my almost having a panic attack, grabbing onto the instructor and clinging onto him for dear life, and resembling Bridget Jones in my souvenir photo…. Ed is under strict instruction to be a little less adventurous with his choice next time! I was so excited to finally meet my very first baby niece. The long drive was totally worth it when I got to have lots of baby cuddles, and I love the photos we took of me and my brother with our babies! The Easter holidays were a chance for us to unwind and chill out, as well as travelling and exploring a little too. I am lucky as my mum is a teacher and she spent the time off with me and the kids. Now Ed is training to be a teacher as well, I am looking forward to him being able to spend quality time with us too. Easter Sunday saw Benjamin turn six months and his very first meal was roast lamb! For my hen weekend I headed over to Bath to do cupcake making, which was so much fun! Back in Bournemouth, a butler in the buff came over to get the party started, and the following day I went to a spa and for an Indian meal in town. It was so lovely! Two of my closest friends happen to live miles away from me. We try to meet up as often as we can, although sometimes this is months apart. When we do spend time together it is as if we were never apart and we always have a brilliant time filled with laughter. This time round we stayed in a cheap hotel, had good food, lots of wine, plenty of snacks and finished the break with a trip into Winchester for some shopping. In May half term, my mum, nan and I took the kids to Spain for a week in the sun. Although Ed wasn’t able to join us, it was a really lovely break and got me so excited for our wedding abroad when we witnessed a couple at the hotel we were staying at. This was the first time I made a proper effort with my photography and I was really proud of some of the photos from the trip. It made me want to up my game when it came to my blog photography. I never even knew children could ‘graduate’ from nursery, but apparently this is now a thing. Still, it was an excuse to make a big fuss out of Carly as she took the next step in her life, and how adorable did she look in her graduation cap and gown? The summer holidays went by in such a blur this year, with our wedding right at the end. We still managed to fit some fun activities in though, like a trip to the Harry Potter Studio Tour, which Cameron absolutely loved! During the summer we spent quite a lot of time hanging out as a family. I had bought Ed a barbecue for his birthday, and we hosted a few parties in our back garden, which were a lot of fun. We also attended a family wedding, spent some time with my dad and his fiancée in Essex and my mum and I took the kids away again, this time to the Isle of Wight. It was a lovely summer filled with family times. I also got another visit from Abi and Georgie, my uni friends, which was lovely! At the end of August, we headed off to Santorini, a Greek island, to get married. It had been a stressful journey getting to that point, with lots of hassle from our wedding planning company making me feel physically ill beforehand, but all of that was forgotten when we flew out with our family to enjoy a week in the sun together for such a special occasion. We got married on Saturday 2nd September and it was truly a beautiful day. The sun was shining, the sky was a brilliant blue, and we were so lucky to have some of our closest friends and family there with us. Although we don’t have a lot of professional shots taken on the day, the photos we do have are so special to me. They show a day filled with love and laughter, and I will always hold a special place in my heart for Santorini now. When we got back from Greece, it wasn’t long before Carly started in reception. It was such a huge milestone and I was, and continue to be, really proud of how she adapted to being at school full time. She also looks absolutely adorable in her uniform! Cameron turned 7 in the middle of September and we celebrated with pizza and presents – the perfect birthday! Benjamin turned one in October. The first year of his life went by in a blur and I couldn’t believe he was already a whole year old! It also marked a whole year of breastfeeding for us, and I was so proud to have reached (and now exceeded) my breastfeeding goal. In October half term, we spent some lovely time together as a family as Ed had started his training course and had the school holidays off for the first time. We made some wonderful memories together. Ed and I also managed to get away for a night for our minimoon. We stayed at a lovely local hotel, had lots of yummy food and drink and spent the following day in the spa. It was bliss. The week ended with pumpkin picking ready for halloween. Just after half term was Halloween, and this year we went all out. We hosted a party at our house for family, put on a spooky buffet with party games and pumpkin carving, and the kids went trick or treating with my brother and cousin. We headed up to County Durham again for baby Isla’s christening, which Ed and I were Godparents for. It was a fleeting visit (we travelled there and back within 24 hours), but it was such a beautiful day. As some family and friends hadn’t been able to come with us to Santorini for our wedding, we held a uk blessing and reception back home. It was a lovely evening, filled with food, drink and not one but two wedding dresses (one of them a beautiful Burgundy colour). I am so glad we booked a photo booth as the photos from it are hilarious and totally capture the fun of the night. The week after our wedding reception, my sister graduated from university and invited me along. It was lovely to see her up on the stage after she had a difficult time getting to that point. I am very proud of her. Having had CBT (cognitive behavioural therapy), I was encouraged to be more present. To try and do this, I have been making an effort to get out and about with the children and Ed at the weekends. We live in a beautiful area of the country, and I have been enjoying taking photos of our experiences. Carly turned 5 in the middle of November and we celebrated with presents and a trip to the local bowling alley with a few of her new school friends. I can’t quite believe my little girl is five already! For Ed’s work Christmas party we went along to Bath Christmas market. Ed and I spent our childfree day exploring the market, eating our bodyweight in festive snacks and drinks, and purchasing my very first MAC lipstick and some chocolate for the journey back home. Sounds like you had a fabulous year & all these photos are great for the memory books. It looks like you had a truly wonderful year! Oh wow! 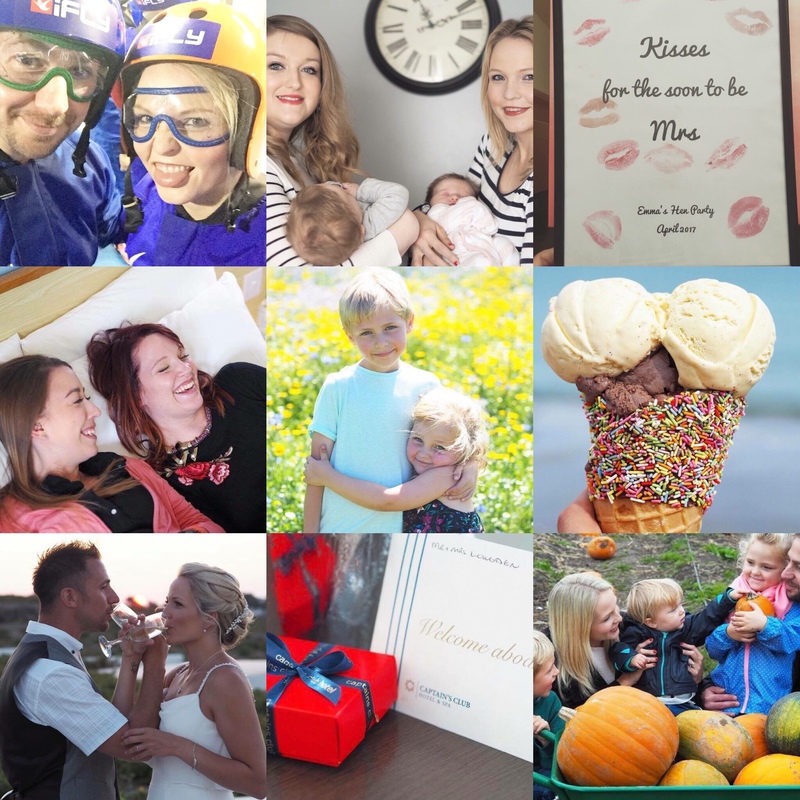 You’ve had a fab year! Congratulations on getting married! You looked beautiful.